Along the development of FAtiMA, the agent architecture, and FAtiMA-Toolkit there have been a number of different integration scenarios that we would like to show you. For each item there is a link within the title, if you wish to learn about the work. Playgen (UK) has been developing a videogame where the player takes on the role of a customer service representative for a spaceship part manufacturer: “Space Modules Inc”. Using FAtiMA Toolkit, each customer has a unique emotional profile and provides a new challenge to the player in each level of the game. Players must learn how to manage intense emotions and how to respond to customers in a professional manner in the best way. In order to demonstrate what the FAtiMA Toolkit can do, we decided to create a Virtual Reality gameplay experience. This experience makes full use of both the Integrated Authoring Tool and the Role Play Character assets. It also makes use of other RAGE-developed assets. as it requires characters to display emotions and players to be focused on their decisions which effectively tests and asserts the quality of the Toolkit. The demo is set in an interrogation room where users play the part of a Police Interrogator and interact with a Suspect, that is a Role Play Character. The player’s objective is to obtain the most information about the suspect they can. In order to interact with the subject, players can select questions from a wide array of possible choices that are displayed in a virtual computer screen. These questions and answers are managed through the Integrated Authoring Tool Asset’s Dialogue Manager. The demonstration can be played without it but it is compatible with most Virtual Reality headsets, and it was created using the Unity Game Engine. Using FAtiMA a social robotic agent was created that is able to play a traditional card game in a social manner. The interaction takes place in a rich environment in which two teams of two players each compete to win the card game. Therefore, the robotic game player has a partner, and an opponent team of two other players. During each game, the robot explores both competitiveness with the opponent team and cooperation with its partner, conciliating the performance of players and the social dynamics that emerge during the game-play. Traveller is an intercultural training tool for young adults. Traveller is based on an original theoretical framework which focuses on key concepts of intercultural training. By progressing through a creative story, users are able to engage via a novel interaction paradigm with intelligent virtual characters that incorporate different simulated cultures which can lead to misunderstandings and sometimes conflicts. Traveller was built on top of FAtiMA, using it to manage the agents’ emotions, and their reactive and deliberative behaviours. Additionally, in order to create culturally-adaptive agents as it is intended in Traveller, an explicit model of culture was integrated in the architecture. 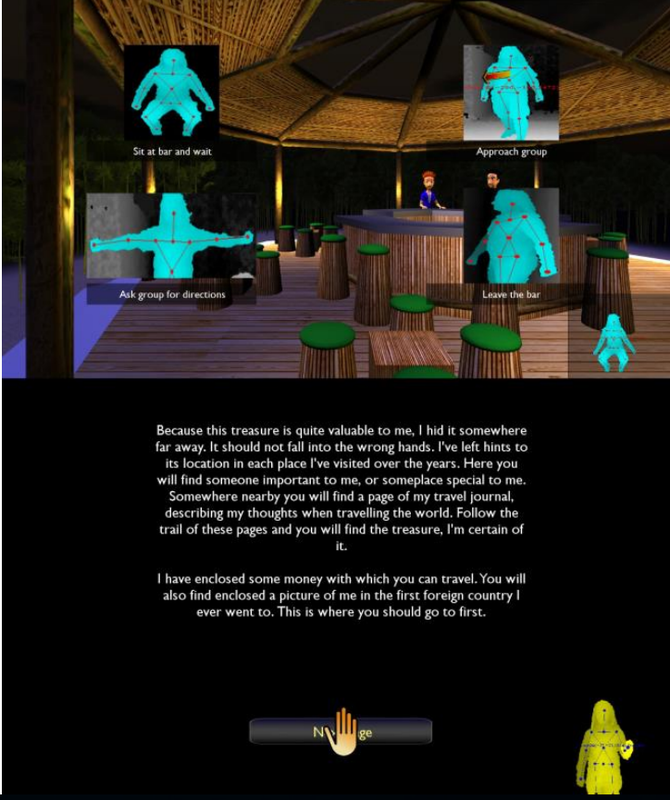 By using an intelligent agent-architecture that is capable of showing cultural differences, and by using innovative interaction devices capable of recognising culturally different gestures, Traveller was able to offer young adults an innovative digital package to increase their intercultural competence through interaction with virtual characters. By adding game-like mechanics, such as interaction and narrative, and by using the tool as part of a larger experience, Traveller is not only educational, but also engaging. Much research has been carried out to build emotion regulation models for autonomous agents that can create suspension of disbelief in human audiences or users. However, most models up-to-date concentrate either on the physiological aspect or the cognitive aspect of emotion. An architecture to balance the Physiological vs Cognitive dimensions for creation of life-like autonomous agents was worked on. The resulting architecture was employed in ORIENT which is part of the EU-FP6 project eCircus, it combines FAtiMA and the PSI motivational system. FearNot! is a virtual drama system for educating 9-11 year olds against bullying. It was produced by two EU projects, VICTEC and eCIRCUS, and evaluated with a large 100 child sample. the characters, who victimizes another of the characters. These are graphically-embodied in 3D cartoon-like form within school and other related environments, with overall scenarios that have been collected from school students themselves in the UK and Germany. Between episodes, the victimized character seeks advice from the child user, of age 9-11, who is able to enter free-text input. This advice changes the internal state of the character, who may then behave differently in the next episode. The educational aim is to allow children to explore the space of responses to bullying given that there is no strategy guaranteed to work, though some strategies are more often successful than others. Characters select actions autonomously within episodes through FAtiMA. The story within a specific episode thus emerges from interaction between the characters, producing an emergent narrative. If you wish to learn more about our work or what we do within the group you can check out the GAIPS oficial website.